The Arena Of Lost Souls is the first Speed Duel Booster! 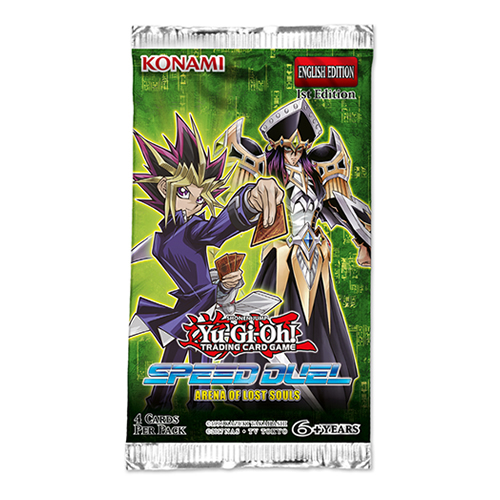 Build upon the Speed Duel Starter Decks: Destiny Masters and Duelists of Tomorrow with 45 new-to-Speed Duel cards and 5 brand-new Skill Cards! The Arena Of Lost Souls Booster Set contains 50 cards, 34 commons, 8 super rares and 8 ultra rares. • Entire set includes: 34 Common cards, 8 Super Rare cards and 8 Ultra Rare cards. • Features brand new skill cards. • 4 cards per booster pack.